Madame Marie Antoinette Leontine Rohmer operated in Paris, France from 1857-1880. Rohmer created elegant Poupée de Mode - Lady Fashion Dolls 14 to 18" tall, made with a China or bisque swivel head kid lined shoulder plate, articulated jointed body of kid leather, usually with a body stamp of; MME ROHMER BREVETE SGDG PARIS. 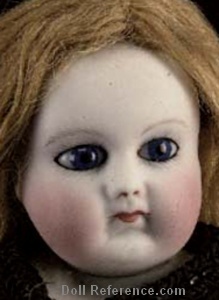 Earliest dolls have rare gutta percha rubber arms (which by now may have deteriorated) or arms made of China or bisque, glass eyes or painted eyes, very detailed eyelids, wigged, blushed cheeks, closed mouth, elegantly dressed in the latest fashions of the day. One can admire the elegant lady fashion dolls made by a remarkable woman, in the male dominated doll industry of her time. Mme. 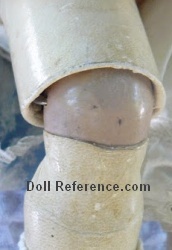 Rohmer Poupée de Mode, lady Fashion Doll, with jointed kid body, 14" tall, bisque lower arms, doll is marked with a body stamp shown above right, head is unmarked, kid knee joint.